Some Vendors Say They will Need New Warehouses to Store All the Corrugate, as Flexographic Printing May be Required Specific to Each SKU; Reaction to Continued Out-of-Stock Challenges? Retail giant Walmart has caused quite a stir in its vendor community, after recently releasing new standards for carton marking that have the potential to add huge costs to its suppliers. Largely out of the blue, Walmart sent letters and supporting materials to vendors in February and March, stating that the changes would "improve receiving, stocking, inventory management and on shelf availability while reducing shrink and labor hours in our stores." There are less draconian steps that can be taken, as noted above, and Walmart may be in effect punishing all vendors for the poor bar code quality of a few. • All 4 sides require item information. Black Ink. A little background here will be helpful. Contrary to a general belief by many in the industry, Walmart has never required - in fact cannot use - serialized carton labeling employing GSI128 (formerly UCC128) bar code standards. That is in large part because GSI128 labeling really only provides value if tied to an advance ship notice (ASN) that details the contents of each case linked to the unique serial numbers on the carton shipping label. But Walmart has never required such ASNs. Instead, Walmart has relied on the GS1 case code, basically like a UPC code but at a carton not item level, encoded using the interleaved 2 of 5 bar code symbology. In general, at its distribution centers, Walmart applies its own serialized bar code on incoming cases, some manually, some using automated print and apply, which then drives each carton's movement through the miles of conveyor and sortation systems before it winds up either on a truck heading for a store or into DC inventory. In this regard, Walmart might be said to be some 25 years behind some of its competitors. Rivals such as Target, Kmart, and many department stores starting UCC128 labeling and ASN programs in the early to mid-1990s, though the grocery industry largely did not adopt the process until just recently, with a few pioneers now with programs in their early stages. Walmart hoped to leapfrog the GS1128 labeling paradigm with its carton-level RFID mandate announced in 2003, which would have provided unique case level identification. But that program collapsed. First, that the GIN case code be achieved using flexo-graphic printing. In summary, this means that this bar code must be pre-printed by the carton supplier. That in turn means that a Walmart vendor would therefore have to maintain a separate inventory of empty cartons for each and every SKU. That is very different than the practice used by most companies today, which print the case code using an "on-demand" approach, typically an inkjet printer, but also sometimes by applying a label. This enables these companies to maintain a reduced set of carton inventories that are then customized for each SKU as they are coming off the production or packing line. Historically, there have been sometimes been issues with case codes printed by inkjet in terms of quality, and if you look in a grocery store it usually doesn't take too long to find a carton that has a case code that looks like it is slanting one way or the other, a result caused by mis-calibration of the equipment. However, even these codes are often readable with today's improved scanning technology. But bar codes printed on white labels actually have superior readability than bar codes printed on the darker corrugate material. Furthermore, "A number of observers I spoke to want to know where Walmart gets off saying that ink-jet-printed bar codes are unreliable when both ANSI and UCC councils thoroughly analyzed their use for an extended period of time and pronounced them reliable," wrote Pat Reynolds of Packaging World magazine. "The same observers are quick to point out that if indeed ink-jet-printed bar codes are not as consistently legible as Walmart wants them to be, there's a much less draconian solution available: Require CPG companies to scan 100% of the ink-jet bar codes they print on their packaging lines and use readily available controls technology to immediately reject any case that is not up to par." Many suppliers are said to be in quite a lather over this. "We will have to build a whole new warehouse just to hold all these cartons," one supplier complained on a recent webinar held by Walmart to explain the changes, according to another supplier who was on-line for the event but described to SCDigest what transpired. In addition to the bar code printing requirement, the other problem for Walmart vendors is that the rest of the marking requirements - which can be printed with on-demand technologies - now have to be printed on all four sides, rather than just one or two as is generally the practice now. That will mean that Walmart vendors likely will have to reconfigure their manufacturing lines with "bump-and-turn" stations. Not only will there be an investment in equipment and systems to make the change, it will slow down the flow of cartons say to a palletizer, perhaps significantly so, increasing production costs. What's driving all this? It is not clear what is behind the concern for bar code quality on cases, though it can be assumed Walmart must be having some bar code read issues in its DCs and perhaps its stores. That said, there are less draconian steps that can be taken, as noted above, and Walmart may be in effect punishing all vendors for the poor bar code quality of a few. Walmart has also stated its personnel have a hard time identifying what products are in what cartons when looking for merchandise in back rooms needed for replenishment on the store floor, with the inference that the expanded and four-sided marking will improve this situation. Then in March of 2014, more of the same, as Bloomberg reported that Walmart executives told another meeting of store managers that if they could solve the out-of-stock issue it could lead to as much as $3 billion in additional sales in the US alone each year. Managers were told that improving "in-stocks" was a top operational priority for the year. 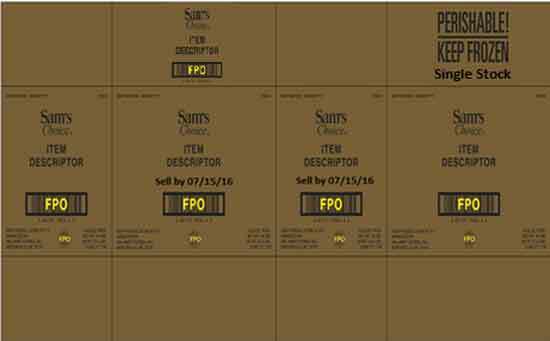 Writing on Labeling Now's web site, David Holliday of print and apply and inkjet printing system provider ID Technology observes that Walmart-s own frozen baked goods group has a mandate for two-sided labeling that can be met with on-demand printing, as shown in the graphic below. Besides the operational and carton inventory impacts of the new Walmart requirements, vendors are also upset with the schedule for compliance. The letter we saw required vendors submit artwork files for the new packaging specs in just a couple of weeks - virtually impossible. Our vendor source said that on another of the webinars that one supplier noted his company has 1,100 SKUs that his company ships to Walmart and surely it couldn't be expected to get all this artwork submitted in such a short time frame. He was told the timeline was firm, our source tells SCDigest. Some vendors are said to planning to refuse to comply. Certainly many if not nearly all would at this point have little or no idea how these changes would impact their costs, nor would they have plans developed on how to store and manage this huge increase in the number of cartons they would have to now maintain. While defying a Walmart mandate may seem risky, that is in fact the path most vendors took with regard to the RFID mandate in the mid-2000s - and that turned out to be the smart move, as Walmart did not ever enforce the mandate, and the program was dropped not long afterwards. Our take: Walmart seems to have rushed headlong into this with little vendor input or consideration. While there may be real benefits here for Walmart, as structured the program will increase supply chain costs and thus end user prices in the end - while Walmart continues to push vendors for lower prices. There are clearly better ways to meet Walmart's goals. SKU specific pre-printed cartons are simply an archaic concept. What do you think of these new Walmart marking requirements? What do you think is going on? What should vendors do? Let us know your thoughts at the Feedback section below - if you want to remain anonymous, please indicate so.